Patent Illustrations do not just contain simple lines that form a drawing. Explained here are 5 basic line types you will see in a patent illustration formal draft. 1. Solid Line: The solid line represents the claimed portion of a design drawing. 2. 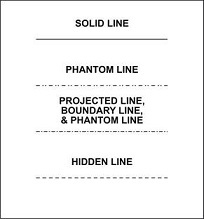 Phantom Line: The Phantom line represents the disclaimed portion of a design drawing. They have been confused with dashed line. They actually will appear as dash dot dot dash or dash dot dash lines. 4. 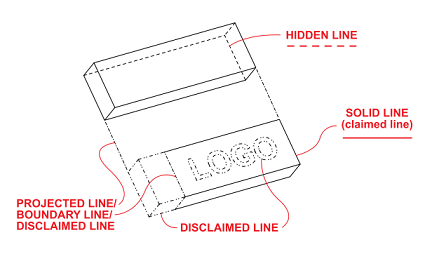 Hidden Lines: Hidden lines are seen in Utility patents more often than others. They are used when a line is obstructed by another part, device, or embodiment and that line needs to be disclosed for patent filing purposes. This line type will appear as dashed. The dashed line is sometimes confused with the disclaimed lines (Phantom Lines) and projection lines. 5. Boundary Line: The boundary line is sometimes practiced in design patent illustrations. It’s used to separate disclaimed areas on an embodiment from the claimed. Like the projection line, the boundary line will appear as dash dot dash. The legend labels the line types and illustrates what these lines will look like.